The Boss GE-7 Equalizer pedal is a great, compact EQ pedal with seven bands of adjustable equaliser sliders. 7 Band Equaliser Pedal A freque.. The Boss GE-7 Equalizer pedal is a great, compact EQ pedal with seven bands of adjustable equaliser sliders. A frequency range of 100 Hz to 6.47 kHz has been divided into seven bands for you to cut and boost to really shape your guitar tone with the Boss GE-7 Graphic Equalizer pedal. Each band has its own easy-to-use slider allowing for quick adjustment and instant visual indication of your tone settings. The Boss GE-7 equaliser pedal features seven band EQ so you can boost and from 100Hz to 6.4kHz, there’s also a slider for you to adjust your overall level for further control over your sound. The GE-7 allows for you to boost or cut up to +- 15dB per band and works great as a “boost” pedal for solos or just giving you an alternative sound to play with when performing. 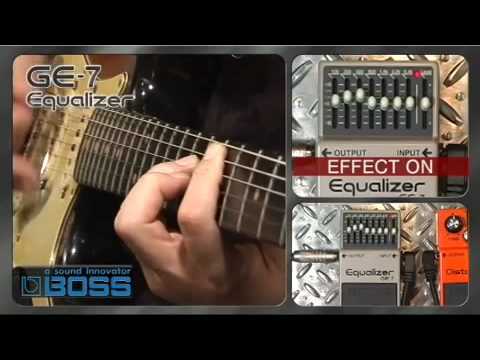 The GE-7 Equalizer pedal is also good for eliminating feedback. As with all Boss pedals, the GE-7 has been built to be nigh on indestructible. The robust metal chassis and its compact design means that the Boss GE-7 is perfect for taking on the road. It’ll fit pretty much anywhere you’d want to keep it for storage or transport and it’s been built to withstand all the rigors and bumps of touring. Dunlop Platinum 65 Cleaner Polish 4 oz.